Photo: Dave Moser – iconic view from Pirates Bay Drive Lookout; with The Lanterns, The Candlestick and Cape Raoul in the distance. This must be one of the best in the world – it’s from the lookout on Pirates Bay Drive, one kilometre to the left from where it leaves the Arthur Highway at the top of the hill. Pause at the lookout for a spectacular panorama of Pirates Bay, the township and rugged coastline beyond, enjoy a great coffee when the Cube van is there, then descend via a scenic winding road into the town. 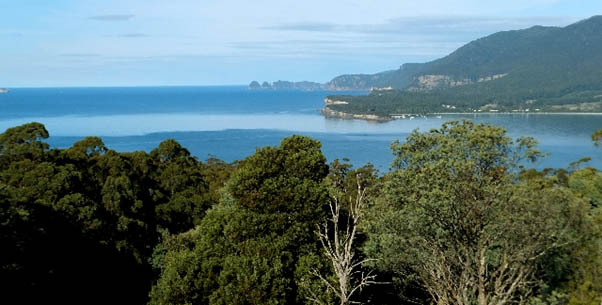 Pirates Bay Drive was once a part of the Arthur Highway and the only road access to Eaglehawk Neck, but it is now a popular scenic alternative route to the ‘Neck’, well worth the extra few minutes travelling time. If you happen to miss it on the way in make sure you check it out while exploring the town, or on your way back to Hobart.